One of the reasons why Android is so popular is that you can customize almost every aspect of it, including change the pre-installed fonts. This can be done in several ways. The more effective ways, in general, require you to have root access on your device. However, you shouldn’t tinker around with your OS if you don’t know what you’re doing – if you get it wrong, your phone may not work properly. Here are some safe ways that let you change the fonts on your Android. If you own a Samsung or LG device – like the Galaxy S2, Galaxy S3 or the LG Nexus 5– you can install new fonts directly by downloading them from the Google Play store. Other device manufacturers don’t let you change system fonts, but these OEMs (original market manufacturers) offer several features that are not a part of the standard Android package. To install new fonts on your Samsung or LG device, go to the Settings menu and then navigate to the Display menu. In the Font Style section, you will see a selection of fonts that are different from the default font. If you like any of those, you can use it. Otherwise, tap the Get Fonts Online option to access new fonts packages on the Google Play store. You don’t need root access for this method. It also changes the fonts everywhere on your device, in all the menus and sub-menus. Launcher apps also let you change the font on your device. Of course, the major drawback of this method is that it will change the entire look of your home screen (launcher apps essentially replace the default home screen). Another drawback is that launcher apps won’t let you change the fonts everywhere on the device. This means that some menus and sub-menus that aren’t under the control of the launcher app will still use the default font. 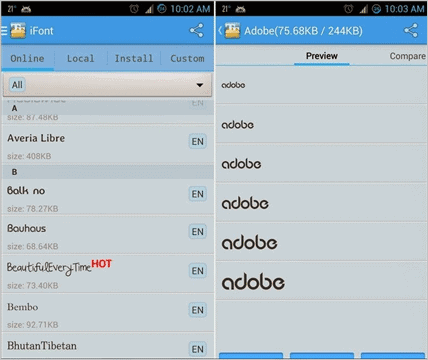 GO Launcher is a popular launcher app that will let you change your fonts. You can get GO Launcher app here. 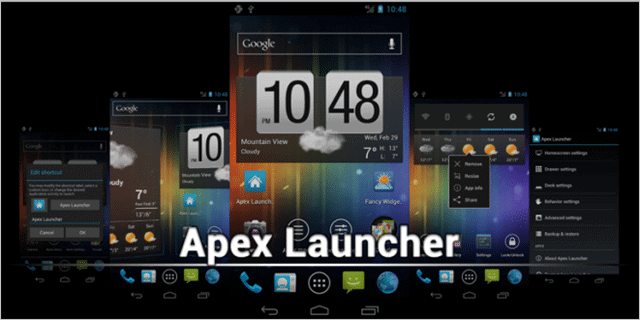 Some of the other popular options are the Apex Launcher app and the 360 Launcher Pro app. If you have installed the GO Launcher app, you will find the fonts option in the Preferences > Visual Settings menu. If you don’t like any of the fonts available there, you can get additional fonts by downloading the Go Launcher Fonts package. Font changing or font management apps can also let you change the fonts on your device. However, they require root access and they may not support all OEMs. For example, the iFont app is primarily made for Samsung devices. It does support other major manufacturers, but it provides additional options for Samsung devices. Get iFont for free here. The iFont app provides its own fonts and lets you use custom fonts as well. To change fonts, you need to download fonts using the iFont app and then set them. To use custom fonts, just copy and paste them from your PC to the custom fonts directory of the iFont app. If you choose to root your device (if you haven’t done so already), the warranty on your device becomes void. Please think it over carefully before installing Font changing apps. If you know your way around the Android OS and are confident you won’t delete or change critical system files by mistake, you can manually change the fonts on your device. To do that, you need to navigate to the System > Fonts menu and replace several font files there. The files will be in the .ttf format. You can either delete or overwrite the files here with files that have your custom fonts. Please note that any changes you make this way will be permanent, so you can’t get your old font back if you don’t like your new one. Here is a good technical tutorial that explains other root based ways to change the font on your device. The easiest and safest way to change the fonts on your Android device is to use launcher apps or font changing apps. Using launchers or font apps will also let you rollback changes if you end up being stuck with a font you don’t like. 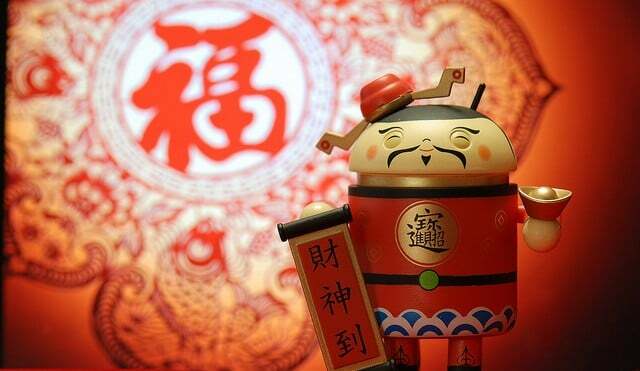 As the Android OS is evolving so are the options to customize it even further with le hassle. With companies like Samsung and LG coming up with their own customized Android packages, this is going to get even easier and we, the users, won’t need to root our phones for such basic changes. Did we miss any options that allow Android users to change the fonts on their devices? If so, please do share your ideas with us, using the comments section below. Previous articleSidewalk Lanes Especially for Texting? It’s Really Happening! Next articleDoes Tim Cook’s Statement about Apple’s Commitment to Privacy Really Matter?